leading change by forecasting shifts within the business environment that will bring increased complexity and new tensions to the organization as it develops. shaping culture to create a social group that elicits strong identification and a sense of belonging. leveraging polarities that may appear to be diametrically opposed, avoiding a dualistic, “either/or” approach to proceed with an holistic “both/and” solutions. spanning boundaries in order to facilitate interdependent decision-making and co production across specialist divisions. These challenges define organisations as complex adaptive systems operating within a wider arena of complex adaptive systems. Modern leaders have the task of interpreting how their organisation is to be sustainable, an extraordinary demand on leaders. Hence, leadership for sustainability requires leaders of extraordinary abilities. These are leaders who can discern routes through complexity, think through complicated problems, engage groups in dynamic adaptive organisational change and have the emotional intelligence to engage with their own emotions in complex problem solving. Leadership through management planning is therefore a process of social influence, which maximizes the efforts of others towards the achievement of a goal. Leadership stems from individuals, not authority or power, and requires others, so there are many styles and many paths to effective leadership. Particularly in the context of sustainable development the common element is to avoid or overcome dualistic thinking. The key to successful leadership for sustainability is being able to bridge cultural divides by avoiding dualistic thinking because it is a divisive force in the human project. In particular, dualistic thinking can so easily separate humanity from nature, men from women and the rich from the poor. Dualism is a simplistic concept that all issues can be divided into either/or states, such as good/bad, right/wrong, determinable/indeterminable. Dualism does not recognize a continuum of values, such as a stretch of varying shades of grey between black and white and cannot explain complexity. Its opposite is holism. Holism is the belief that everything in nature is connected in some way and promotes education in systems thinking to unravel complexity and make connections across divides. As well as being holistic systems thinkers, leaders also have to be sharp planners. Whether you are trying to lead other people or lead yourself, the planning logic of dealing with obstacles is very much the same. You still have to cope with all the variables in the environment, temptations pushing you away from your objective, motivation issues, self-discipline issues and just plain resource barriers to making progress. It is commonly said that leaders tend to be superior planners but inferior doers. However, you cannot be a good doer without planning how to remove obstacles that are preventing you reaching your objectives. Leaders at any level have to look for ways to remove or overcome obstacles. They also want feedback on progression to their objectives. Therefore, to play an active part in implementing a plan, leaders have to be understand the logic of making plans. 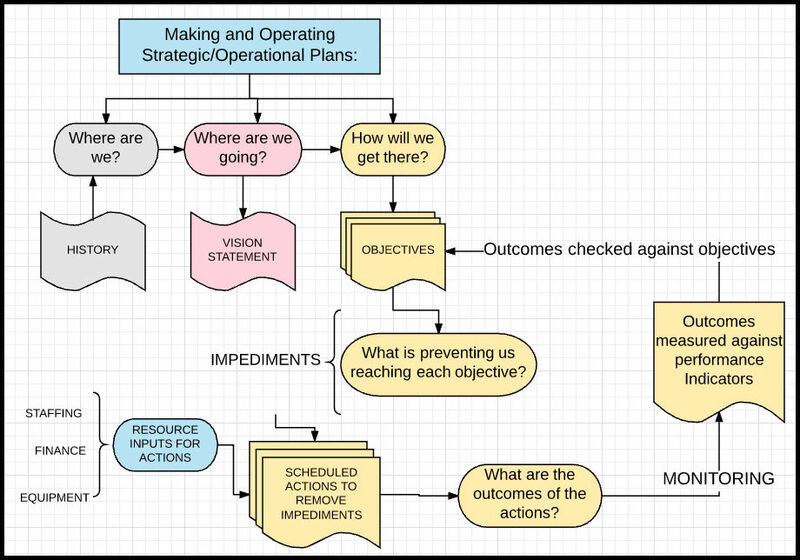 We classify plans as being strategic or operational. Yet there is no difference in the logic used to make a strategic plan or an operational/tactical plan because there has to be a seamless coupling from vision to grass roots action. All plans are management plans because they allow those involved to step back from the current situation and clearly see where they are drifting off course. Leaders require a deep understanding that planning should bridge the gap between strategy design and tactical delivery, In other words, leadership is a multilevel process that spirals down and around the entire organization. The tactics of one level become the planning challenges of the next. From this point of view the planning system, as a technical instrument, has to make the entire planning/reporting system seamless and provide opportunities for its interrogation at any level. Education is not simply the transmission of knowledge from one generation to the next through classrooms, books, and lectures. Holistic education is based on the premise that each person finds identity, meaning, and purpose in life through connections to the community, to the natural world, and to spiritual values such as compassion, altruism and peace. Holism transforms education to become a non compartmented universal process by which each of us and society as a whole engages reason and imagination in a dynamic system from the past in order to adopt values for living harmoniously in the future. The task is to analyse the horrific failures of the human project throughout the past and present, and explore values for a future beyond war, poverty, injustice, and oppression. Dualistic thinking that separates men from women, humans from nature, poor from rich can and should be replaced with a fuller picture of the psychology of human identity and the interdependence of culture and ecology. If the implications of this scientific revolution and the new paradigm of holistic thinking it produces are taken seriously, holism should become the dominating concept in all our day to day thinking. Holism is revolutionary; the source of our gigantic hope for a transformed future, for the emergence of new goals for human existence on Earth. The educational objective is to contribute to a transformed future where the economy of humankind is eventually maintained as a steady state equilibrium with our planet’s productivity. We are on the verge of the ultimate holistic level of existence where we see a world in danger of geo-political collapse as a result of adopting short term management of humanity’s natural capital. The next altruistic level seeks spirituality and unity in living systems; strives to eliminate war, poverty, disease, hunger and political oppression; recognises the potential need to sacrifice self and others as may be required for the overall survival of life; thinks and acts globally. eradicating poverty in all its forms and dimensions, including extreme poverty, is the greatest global challenge and an indispensable requirement for global sustainable development. Sustainable Scale: Creating an economy that can maintain its production and consumption on a level at or below the Earth’s ability to renew resources and absorb waste. It’s simply making the economy sustainable. Fair Distribution: A steady state economy must not simply be sustainable from a biophysical standpoint, but also from a social standpoint. Creating the means to allow everyone the capacity to flourish is drastically important to a secure, stable and prosperous economy. Efficient Allocation: The more efficient our economy functions the better use of resources and time we can allocate. As with any economy, the market is not perfect and we must take into account the externalities that harm our society’s ability to use resources wisely and efficiently. High Quality of Life: What is the true purpose of creating a society and economy if not to give us a high quality of life? In a steady state economy this is not a weak side effect of the economy but an actual goal and purpose of the economy. When we stop focusing on growth we can focus on making our lives better, for everyone. and aim for diversity rather than homogeneity. All three principles are informed by feminist theory. Thus, it is argued that the voices of women who have gone largely unheard in economics are essential to reconceptualizing economics as sustainable. The focus on sustainability as the guiding principle for future economic activity has generated many, and often conflicting. definitions of sustainable economic development. Yet while the terminology may be new, the discussion is not. It parallels the discussion about biases of economic valuation that have long ago led to the neglect of the domestic and subsistence contributions relegated to the “informal” or household sector. The three pillars of sustainable development — economic, environmental and social — are also relevant to discussions of gender equality as a factor impeding the implementation of strategies for sustainable development at all levels, In particular, an increasing number of studies indicate that gender inequalities are extracting high economic costs and leading to social inequities and environmental degradation around the developing world. Therefore, a new economic model for living sustainably must be gender neutral and incorporate feminist steady state economics. Feminist economics is the study of economics including its methodology, history and empirical research aimed at attempting to overcome male biases. It focuses on topics of particular relevance to women that involve the exclusion of women from contributing to organisational innovation, effectiveness and survival. to initiate action among people. All are important but it can be argued that the most important is leadership to initiate action among people. Research into industrial creativity has shown there is a positive relationship between leadership which encourages or promotes both individual self management, and the ‘stimulant’ dimensions of the work environment for creativity. To release this organisational creativity leaders have to use behaviour in ways that encourage employees to manage their own behaviour, develop greater freedom, autonomy, and self-motivation that are most conducive to creativity. 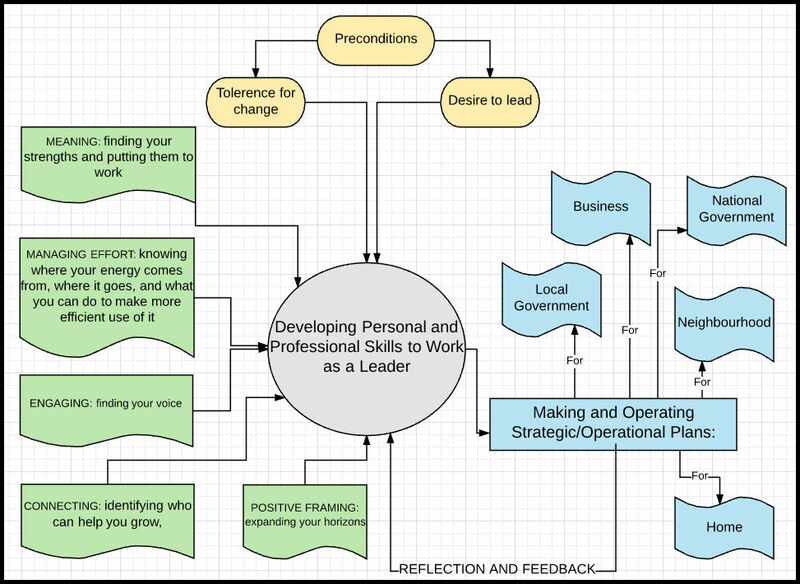 The other two leadership activities provide the technical framework in which leadership for creativity can thrive. Most dictionaries suggest leadership and management are quite similar with respect to guiding or controlling a group of people to achieve a goal. 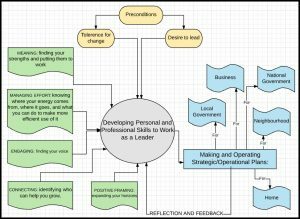 Leadership, regardless of where it comes from, formally appointed leaders or Informal leaders, provides the link between ‘planning’ and ‘doing’. Effective leadership helps unify strategic planning and the organization itself, helping to overcome inertia and the tendency to keep things the same with silo thinking. Without leadership planning, most strategies will end up as dead pieces of paper. Most importantly, when strategic planning occurs without leadership taking the lead, cynicism increases when staff see that the plan is being ignored, or even violated. The outcome of this is that formal leaders suffer a loss of credibility. A vision and its value statements are the core of leadership and are at the heart of strategy. The leader’s job is to create the vision for the enterprise in a way that will engage both the imagination and the energies of its people. The vision and value statements need not be complicated. Howard Schultz brought Starbucks to where it is today: a vibrant, growing, hugely profitable company with global brand recognition. He has developed and promoted a strategic vision from the beginning: to make Starbucks “the most respected brand name in coffee and for the company to be admired for its corporate responsibility.” Two key values that supported this vision were “to build a company with a soul” and to pursue “the perfect cup of coffee.” To realise the vision and its values Schultz had to lay out a plan that people would grasp and accept out of trust, then get everyone working from top to bottom to achieve the objectives. These are simple phrases, but they have given direction to a highly successful enterprise! These three questions are the basis for making any kind of plan, whether the plan is strategic or operational. A successful plan sets priorities, focuses energy and resources, strengthens operations, and ensures that employees and other stakeholders are working toward common goals. Setting goals or objectives is what strategic and operational plans have in common. The strategic plan itself really deals with Where are we going? And How will we get there? The future is impossible to predict, but contemplating scenarios will focus a leader’s attention and help her define the future for the business. Specifically, it compares her organization to her competitors. What do you do best? What makes you unique? What can your organization potentially do better than any other organization? Answering these questions will help formulate a picture of what the makeup of the future organisation will be and what it is planning to achieve. Answering this question produces the core of a plan. It’s also the most time consuming. There are a number of routes from the current position to realise the vision, and choosing the right one will determine how quickly or slowly the strategic objectives are met. Planning is a disciplined effort. In the end, it produces fundamental decisions and actions. The objectives shape and guide what an organization is, who it serves, what it does and why. With a focus on the future, effective planning also articulates how an organization will know if it is successful. The latter requires using measurable performance indicators to monitor the outcomes of the plan. There should be seamless connections between strategic objectives and tactical objectives This makes it imperative that the leader and her managers have been educated to follow the same planning logic. Leadership education, like leadership itself, must rely on heuristic approaches such as mentoring, coaching, patterning, and, trial-and-error experience. Most educators agreed that individual personality traits provide at least part of the basis upon which leadership skills are built, and such characteristics reach stability by adolescence. Hence, a frame is established that drives how future managers view their roles, their style of communicating, and their modes of interaction with others. Clearly, these frames can change, and individuals can learn to view things differently. Managers, like educators, continue to grow socially, physically, and intellectually. However, this early grounding and foundation may strongly influence the choice of career or profession, the style or attitude toward work relationships, and the approach of managerial roles and interactions, including leadership roles. 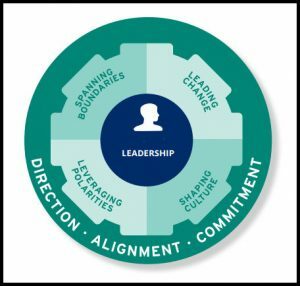 Leadership tests common assumptions about who counts as a leader and proposes that anyone who takes responsibility for understanding and acting on sustainability challenges qualifies as a ‘sustainability leader,’ whether or not they hold formal leadership positions. They lead ‘with’ rather than ‘over’ others in ways that account for the long-term viability of complex, interconnected living systems. Paradox, contradiction, and differing viewpoints are recognized as natural characteristics of healthy systems. Sustainability leaders recognize that the experience of change itself, and the dissonance it creates, fuels new thinking, discoveries, and innovations that can revitalize the health of organizations, communities, and the earth. Finding the balance among and between simultaneous and sometimes contradictory demands for economically, socially, and environmentally sustainable solutions is a compelling leadership opportunity ultimately grounded in a personal ethic that reaches beyond self-interest. These points are exemplified in the following leadership actions. Consumers are increasingly looking to buy ethically sourced, sustainable products, especially in the food sector. Brands should use their sustainability as a point of difference to encourage sales. One of the main cultural barriers across society is the focus on short-term key performance indicators (KPIs) and budgets. A sustainable business needs to encourage all those it works with to look at, and reward, long-term results. This idea is perhaps most apparent in the construction industry, where the perceived higher cost often blocks the creation of greener buildings. When looking at costs across the lifetime of a building, it really makes economic sense to build a green building. People become involved with sustainable businesses for a variety of reasons. For a graduate, it might be the interesting work or the higher purpose. For an investor, it might be the unique nature of the business and its growth potential. Sustainable businesses should, therefore, tailor the way they communicate with each group, depending on their interests. Be clear about what’s important to each, and also what sort of language and approach will be most effective..
Changing organisational structures or creating roles, such as sustainability managers, might only act as a bolt-on, when a complete change in business culture and managerial priorities is needed. Embed cultural change and responsibility at all levels of decision making, because sustainable thinking works best when it is fully part of the business’s strategic direction. Sharing knowledge from the experts to every member of staff is one of the biggest challenges to achieving full sustainability. It is difficult to find the opportunity to give all our design teams a practical knowledge of our future world, so that they can design to it. Good management, however, could make this change happen. Many sustainable businesses have taken risks by investing in systems and technologies that are not yet mainstream. While it is easier for new businesses to set up in a sector with more developed systems working and paying for themselves, it is much tougher for early adopters to raise the finance for relatively unproven technology. Disruption has the greatest impact when it interfaces with and improves existing infrastructure or attitudes. There are a number of regional initiatives that give smaller – and startup – companies the opportunities to meet, network with investors and establish like-minded and sustainability-orientated companies. Many businesses tell a pleasing sustainable story when they sell their own products, but they might not buy into the sustainability stories presented by other companies. While some stories can be greenwash, he says, sustainable businesses can support others like them by buying their products. Continuing to meet and share experiences even in tough times can inspire and encourage businesses to keep working towards their goals. It is important to keep sharing successes. McKinsey & Co is a global management consulting firm that serves a broad mix of private, public and social sector institutions. The organisation helps clients make significant and lasting improvements to their performance and realize their most important goals. and engaging, or finding your voice, becoming self-reliant and confident by accepting opportunities and the inherent risks they bring, and collaborating with others. Although the research mostly involved inputs from women, the model is also suitable for men, particularly where there is a search for gender free platforms for personal leadership development. The original McKinsey model has been reorganised as a management system in Figs 2 & 3. The system applies the outcomes of leadership development to make and operate strategic, tactical and operational management plans. As a dynamic process it sustains a state of sustainability in a range of situations, home, neighbourhood, business, local government and national government. Feedback and reflections from the outcomes of plans are used to improve managerial performance. 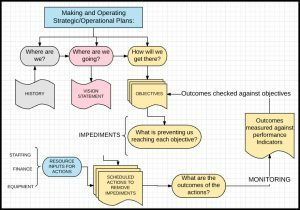 A plan for managing and operating strategic or operational plans begins with answers to three questions. The question, Where are we?, is answered by describing the present situation which is embedded in history . The question, Where are we going?, Prompts a vision. or mission statement of the organisation as it will be in the future. How will they do it ? What is required for them to do it ? How progress towards meeting the objectives will be tracked is by comparing the outcomes of the work with the objectives using performance indicators. This monitoring process closes the planning loop, and allows modification of the inputs if the objectives are not being met. The planning logic is basic to all management plans. Although a plan may be set out on paper it is much easier to write, operate and report from using a relational database. You are currently browsing the Cultural Ecology blog archives for December, 2017.